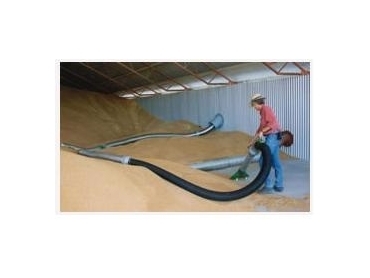 The Agri-Vac pneumatic conveyors from CustomVac Australia use a powerful vacuuming action to remove grain efficiently without the need for shovelling and dust. These blowers create a vacuum and will draw in the grain and air which will then be separated in the receiver. Material will then flow into the unique drop through airlock and after a cyclonic action the air is pre-cleaned before it’s moved into the blower. High pressure from the blower will move material out of the airlock and into a truck, bin or silo. Saving costs – no hidden costs and because the pneumatic conveyors can be used with all forms of storage and a winder range of materials, no other machinery needs to be brought. Easy use – The hydraulically controlled booms simplify truck loading and flexible hoses attach easily and give access to tightest spots. The self cleaning features minimise insect and cross contamination. Capacity – A range of models to suit your needs from a 10 tonne per hour up to 100 tonne per hour. Reliability – Proven in Australia for 20 years, the full service and technical back up which CustomVac provide allows for a complete piece of mind for the customer.